While his successor Theresa May is struggling back home, it appears that Brexit and all its consequences are the least of David Cameron’s worries right now. The former Prime Minister was spotted at Shanghai’s iconic Bar Rouge on Thursday night — which is Ladies Night, if we might add. 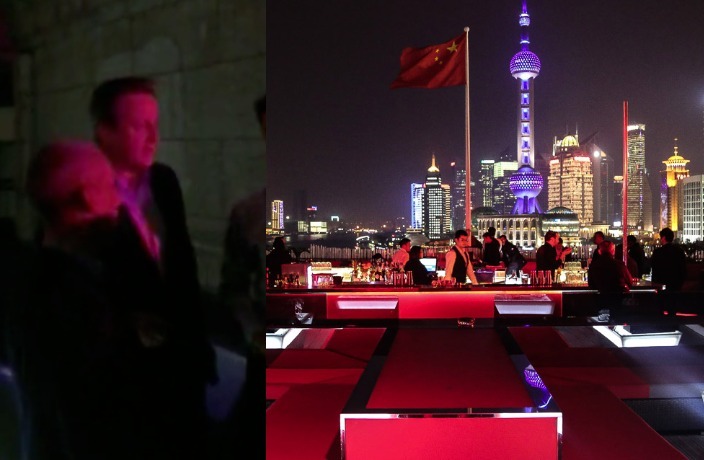 In a video provided to That's Shanghai, Mr. Cameron can be seen sitting down at an enclosed private/VIP table at the bar, enjoying the stunning rooftop views of The Bund. As Cameron leaves his table, he is flanked by a few men who appear to be his security detail, for which all former Prime Ministers are eligible. If it can be speculated as to why the former Prime Minister is in Shanghai, it is most likely to be in a business capacity. In December 2017, he took up a job to lead a GBP750 million (almost USD1 billion) UK-China investment initiative. Or perhaps he’s here for a networking event, dinner or a speech, which is a pretty common thing for Prime Ministers and other world leaders to do after leaving office. But it's a hefty price to rub shoulders with David Cameron. Earlier this year, reports emerged that the opportunity to enjoy dinner and take a selfie with Cameron in Shanghai would cost a whopping GBP12,000 (approximately RMB106,000). Cheap eats and tiny seats at our new favorite ramen house. Sorry Shanghai foodies, but the popular grocery delivery service Fields​ has abruptly decided to shut down. Swiss Butchery will officially open its fourth premium butchery shop in Huacao Town this weekend. Your guide to eating and drinking in Shanghai for this week. L'Avenue is hosting a series of festive, kid-friendly Easter events all weekend long. And we're giving away free tickets!